After a lengthy absence during which I studied for the most challenging mental exercise I’ve ever faced – departmental Comprehensive Exams – I’m going to kick off 2014 with another discussion about the early 21-century warming “hiatus”. There is good reason for this: the climate is complex and understanding the individual parts remains as active research, to say nothing of how those parts interact, which adds complexity upon complexity. It also gets me back in the swing of writing again. Global warming first became evident beyond the bounds of natural variability in the 1970s, but increases in global mean surface temperatures have stalled in the 2000s. Increases in atmospheric greenhouse gases, notably carbon dioxide, create an energy imbalance at the top-of-atmosphere (TOA) even as the planet warms to adjust to this imbalance, which is estimated to be 0.5–1 W m−2 over the 2000s. […] An energy imbalance is manifested not just as surface atmospheric or ground warming but also as melting sea and land ice, and heating of the oceans. More than 90% of the heat goes into the oceans and, with melting land ice, causes sea level to rise. For the past decade, more than 30% of the heat has apparently penetrated below 700 m depth that is traceable to changes in surface winds mainly over the Pacific in association with a switch to a negative phase of the Pacific Decadal Oscillation (PDO) in 1999. Surface warming was much more in evidence during the 1976–1998 positive phase of the PDO, suggesting that natural decadal variability modulates the rate of change of global surface temperatures while sea-level rise is more relentless. Global warming has not stopped; it is merely manifested in different ways. Some important notes here. Greenhouse gases consistently increased during the 20th century, with increasing rates in recent decades. But how do those GHGs affect the climate? They emit radiation back towards the Earth’s surface, but it takes time for that radiation to manifest as detectable heat. It’s a slowly accumulating effect, which other processes and phenomena influence. To be more specific, the Earth’s surface temperature (land and ocean) shows the effect of that slow accumulation decades later. This decade’s surface temperatures are largely the result of GHG concentrations from 20-30 years ago. Which means that today’s concentrations will largely affect surface temperatures 20+ years from now, not today. 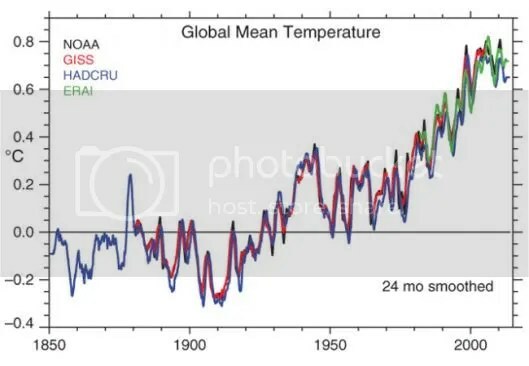 Let’s take a look at one of the study’s graph’s – global mean surface temperature anomalies from 1850-2012. Figure 1. Global mean surface temperature anomaly (1850-2012; Trenberth & Fasullo) as observed by the four most used datasets. 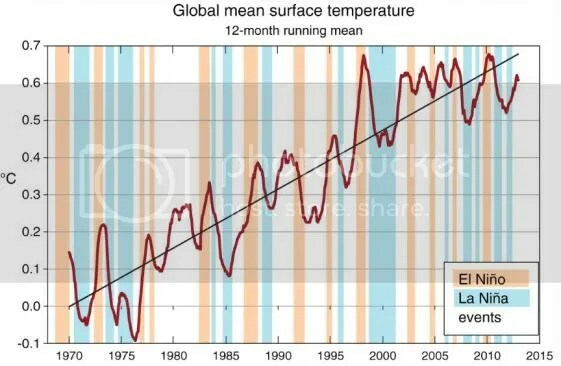 After a rapid rise in the 2nd half of the 20th century, it does indeed appear as though warming has paused since 2000. But I just wrote that GHG concentrations increased throughout the 20th century and into the 21st. So why does the “pause” appear in the temperature record? Because of other climate processes, in this case natural processes that I’ve also written about (see here and here). Figure 2. Global mean surface temperature anomaly (12-month running mean) with El Nino (orange) and La Nina (blue) events highlighted. Figure 2 shows how the biggest high-frequency climate oscillation impacts global mean surface temperature anomalies. Following the record-setting 1997-1998 El Niño, annual temperature anomalies stayed primarily within +0.6 to +0.7C. The paper hypothesizes that the 97-98 El Niño initiated a change in longer-term oscillations – namely the Pacific Decadal Oscillation (related to the Interdecadal Pacific Oscillation, which impacts my own research). Figure 3. Time series of Pacific Decadal Oscillation Index (1950-2013). Phases characterize the index: warm (1977-1998) and cool (1948-1976 & 1999-current). Look back at Figure 1 and the PDO’s effect on global mean surface temperature anomalies is clear: less warming is present during the cool phases and more warming during the warm phase. Now, this analysis is limited by the relatively short observational period, but researchers are teasing out PDO effects from paleoclimatic studies going back hundreds of years. The PDO’s cool phase is characterized by cooler than normal eastern Pacific sea surface temperatures. Averaged out over 10-30 years, the cool phase looks remarkably similar to La Nina. Conversely for the warm phase, the eastern Pacific is much warmer than normal and resembles a long-term El Niño. Now for some complexity. The short-lived El Niño/La Niña events occur on top of the PDO signal. So the Earth can have a long-term cool phase (negative PDO) and have both warm and cool ENSO phases (El Niño/La Niña) on annual to interannual timescales. Look at Figure 2 again to see the additive impacts. The 1997-98 El Niño occurred at the end of the last PDO warm phase, but also during a warming trend whose timescale exceeds the PDO’s (anthropogenic climate change). Four recent La Niñas occurred during the current negative (cool) PDO phase within the past 10 years (see Figure 2). Is it any wonder then that global mean surface temperatures haven’t risen at the same rate they did during the 1977-1998 period? So what does this mean going forward? First of all, I disagree with the 2nd half of Trenberth’s statement: “This year or later, it’s possible that El Niño will occur again in the Pacific. Will that trigger another change in the PDO, that in turn could trigger a resurgence in global surface temperature warming? Only time will tell, Trenberth explained.” Given the historical PDO record, I seriously doubt the next El Niño will switch the PDO phase back to positive (warm). The PDO has been in its current negative phase for only 14 years or so now. It’s more likely that this negative phase will continue for at least the next 5 years. I wouldn’t be surprised if it continued for the next 10-15 years. Which doesn’t mean global temperatures won’t rise; it means they would likely rise at a slower rate than they did during the late 20th century. When the next PDO positive phase occurs, global temperatures will likely show that shift by increasing at a faster rate than during the past 15 years. 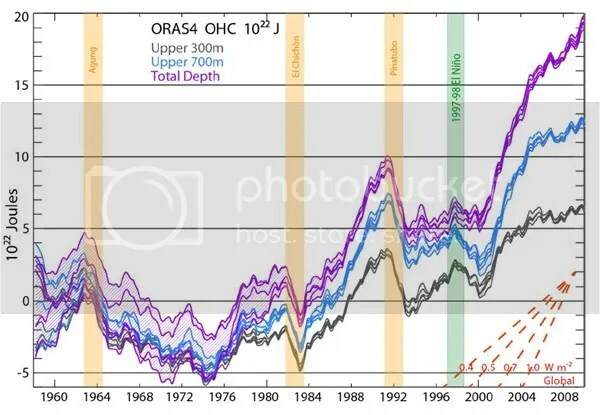 This graph shows that during the global warming “pause” period (1999-current), the ocean below 700m absorbed the majority of the heat of the entire ocean system. You can also quite clearly see the anomalous heat content of recent years. This increased oceanic heat content will manifest itself in upcoming decades and centuries. Sea levels will rise because warmer substances occupy more volume than cooler substances. That effect alone threatens the majority of the Earth’s human population. It also threatens frozen water reservoirs: the globe’s ice caps. As they melt at an increasing rate throughout this century, global sea levels will rise even further. As warmer deep ocean water returns to the surface and interacts with a warmer atmosphere which can hold more moisture and therefore heat, the heat will eventually transfer to the atmosphere where we can more regularly measure it. So aside from the natural climate oscillations discussed above (ENSO & PDO), much of this heat will affect us at some point. Will we be ready for those impacts? Contemporary examples suggest no, but municipalities are taking already visible threats more seriously every day. Those local efforts will guide actions at higher levels of government and society. 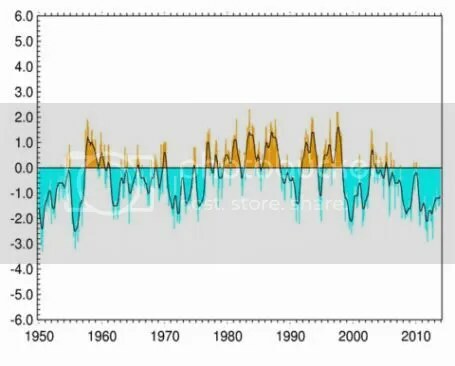 Categories: environment, global warming, policy, science | Tags: climate oscillations, El Niño, ENSO, global temperature, global warming hiatus, global warming pause, IPO, La Nina, ocean heat, PDO | Permalink.